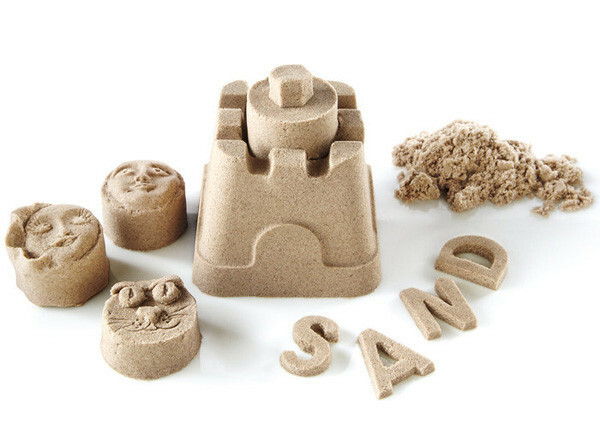 Kinetic Sand is the perfect material for open-ended, non-directed play. Children learn creativity and sharing skills with sand play. Is it messy? Not sure… Is it conductive? Let’s see… Sandbox Manifesto? Almost! Great excitement today as we opened our new boxes of Kinetic sand. 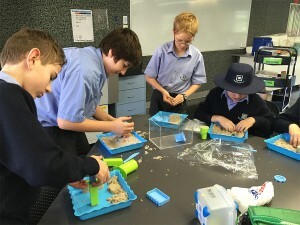 I was looking for an alternative activity to complement all the robots, tinkering electronics, Arduino bits and pieces to remind the boys that Maker Spaces are not always about electronics. Sometimes we just want to kick back and enjoy each other’s company creating amazing structures, and testing our creative juices. Success! With more sand next week, we will run a challenge to see how quickly the boys can create an Historical memorial that might reflect an aspect of their own life… and there will be chocolate for rewards! 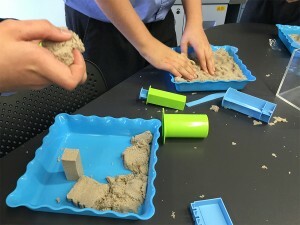 The sand is not messy.. it seems to stick together, and with our individual trays and tools to share, it quickly became a great collaborative lunchtime activity. We purchased ours from the local Spotlight store, and I will be investigating the recipes readily available here and on Pinterest. We can’t have enough it seems!